Famed legal writer John Grisham calls them Rainmakers. We’ve celebrated their legendary victories in cinematic works such as “A Civil Action” and “Erin Brockovich.” In Hollywood, these plaintiffs attorneys are often portrayed as Davids to their opposing Goliaths of corrupt industry. But who are they in real life? 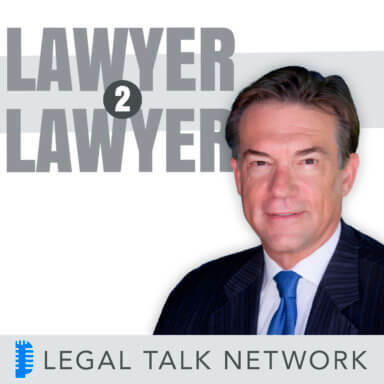 In this special edition of Lawyer 2 Lawyer, hosts Bob Ambrogi and J. Craig Williams interview titans of the courtroom Mike Papantonio, Howard Nations, Thomas Girardi, and Fred Levin. In the first segment of this show, they reveal their most respected defense counsel, discuss the traits of successful trial attorneys, as well as evaluate the contingency fee model. In the second segment, Bob and Craig interview Fred Levin about his new biography which covers his very colorful life and career. Tune in to hear about his victories and his defeats. Howard Nations is an inductee at The Trial Lawyer Hall of Fame whose national practice is currently working on litigation for Actos bladder cancer, defective hip implants, transvaginal mesh, Pradaxa, and the BP Deepwater Horizon oil spill. As a pioneer in courtroom technology, Howard was the first attorney to have computer-generated liability and medical animations admitted into evidence at trial. Among his many awards, he is the recipient of the W. McKinley Smiley, Jr., Lighthouse Award; the Belli Society’s Mel Award; and MTMP’s Clarence Darrow Award. Thomas Girardi is an inductee at The Trial Lawyer Hall of Fame who’s commonly known for his work in Anderson v. Pacific Gas & Electric (the case made famous by the Erin Brockovich film). Among his numerous headlines, Mr. Girardi secured a 4.85 billion dollar settlement from Merck for Vioxx, a 785 million dollar verdict from Lockheed for personal injuries, and a 1.7 billion dollar settlement from the State of California for manipulating natural gas prices. Fred Levin is commonly referred to as the man who brought down Big Tobacco by helping to secure the largest settlement in US history. To date, he has won over 100 jury verdicts and settlements worth at least one million dollars. During his very colorful career he represented heavyweight boxing champion Roy Jones Jr., helped start the national firm of Johnnie Cochran, be-friended multiple Presidential candidates, and been investigated for murder twice. Today, Mr. Levin still practices as a senior partner at Levin, Papantonio, Thomas, Mitchell, Rafferty & Proctor.